All transactions are safe and secure with a reliable history in online purchasing behind each of our associates. 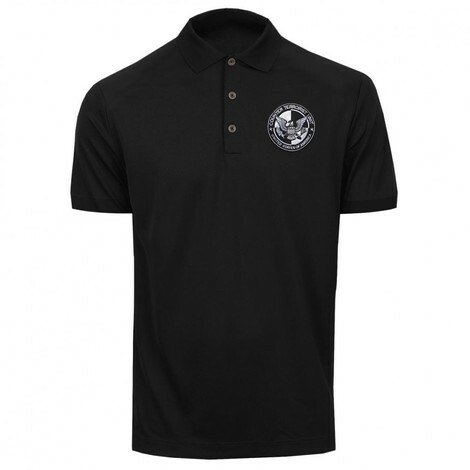 Buy the 24 CTU Embroidered Polo t-shirt to own 24 clothing and merchandise. Although Jack Bauer's interrogation methods are sometimes extreme, they get the job done and they save American lives. Show everyone that you are a proud graduate of the Jack Bauer School of Interrogation by wearing this cool 24 polo tee shirt that features an embroidered CTU seal on the front. "You have no idea how far I'm willing to go to acquire your cooperation." Repeat your favorite 24 quotes and let them know you mean business. In addition to the 24 CTU Embroidered Polo tee above, browse the 24 Clothing Gallery for more apparel like men's and women's clothes, kids shirts or hoodies.